Blabigail » I love school! 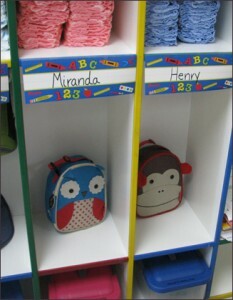 Yesterday I took Henry and Miranda to their preschool to check out their classroom for the Meet-and-Greet hour. They got to check out their cubbies and play with toys. And oh! The toys! Two-year-old heaven is a room chock full of never-seen-before toys. When we left, they were both very concerned that we weren’t bringing their new nap mats with us. “YES!” was the resounding reply, though I’m sure they really were just responding to my excited tone. 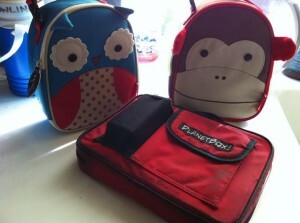 Miranda's owl and Henry's monkey lunchboxes from Skip Hop, and Ethan's Planet Box lunchbox. Later that evening, I found myself in the kitchen, staring at their lunchboxes, slightly paralyzed with the uncertainty of what to pack. While Miranda is definitely a better eater than Henry, there are just as many days as not that she eats a pitiful lunch. And Henry…oh, Henry. My pickiest eater. My little boy who refuses to eat bread, noodles, eggs. All things he used to eat until one day last summer when a switch flipped and he just…stopped eating everything that was put in front of him. My little guy who has a love affair with milk and thankfully — THANKFULLY — likes peanut butter. I cannot express just how relieved I was to find out there are no nut allergies in their classroom. 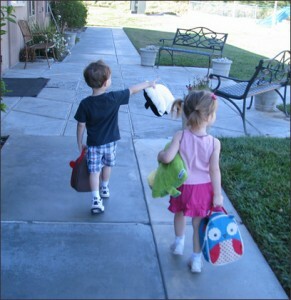 In the morning, after Jack and Ethan left the house, I got Miranda and Henry dressed, and reminded them to go upstairs and get their little animal pillows. They were practically falling over with the excitement of getting to bring them. In the car, they were each hugging their pillow. I tried getting them to stand still for a photo op outside the gate, but they were having none of that. Through the gate they went, lunchboxes and pillows in hand. I watched them — full of confidence and milk — stride toward their classroom. And then hold back a little. “Mommy, hold hand peese?” Henry asked. “Of course, little guy,” I slipped my hand in his and we watched his sister wrestle her load while trying to open the door. Dude, they're all official and stuff, now. Hesitation was tossed aside for the excitement of getting to place lunchboxes in cubbies. “I’m going to go to work now, kiddos,” I said, ten minutes later. “Bye, Mommy!” Henry yelled from across the room. “Miranda — don’t forget to say goodbye to your Mommy,” Teacher Robin gently reminded. Miranda looked up from the stickering project she had started with Robin and giggled. At noon Robin reported in via text that both kids were doing great and didn’t once ask for me. I was both sad and elated. They were, however, very excited to see me when I picked them up, based on the hugs I received. On the way home, as Miranda slipped into slap-happy-dom, Henry sighed. Aww, they are growing up so fast! I loved reading this post and can’t help but think that Mio’s first day of preschool will probably also come sooner than I think! I loved reading about the exciting first day of school and the photos. Thank you for sharing.